Empower your business wherever you are. In today's world if you're in business you need to communicate and communicate reliably. With Satellite Broadband installed, your internet access is 'always on' and even the most remote rural business can enjoy all the benefits of the city without having to leave the property. Satellite broadband from BayCity Communications can get you connected to the Internet wherever your business, or aspects of your business are located in New Zealand. This is ideal for rural based organisations or companies whose operations demand that communication links are established at remote or rural locations. Our Satellite broadband and associated services do not rely on the integrity of New Zealand's core telephone and cable infrastructure, making it an ideal disaster recovery or backup solution for organisations that depend on timely communication. 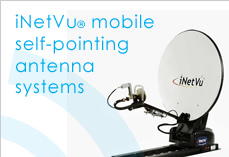 When combined with an iNetVu mobile vehicle mounted mobile antenna the options for delivering business grade connectivity are endless. 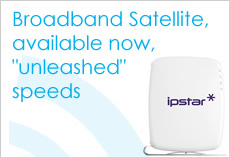 Everywhere you look there are commercial applications for Satellite Broadband. Business Connectivity - A commercial revolution is taking place with New Zealanders spending more than $1.5 billion on goods and services over the Internet last year. Just because you're in a rural community doesn't mean you should miss out! With Satellite broadband you can be right at the heart of the digital marketplace and enjoy the benefits that other businesses can provide. Mobile Connectivity (iNetVu) - With the iNetVu vehicle mounted mobile Antenna customers can take an IPSTAR connection anywhere they go. This is ideal for organisations that need to take their office on the road or set up temporary locations. Disaster Recovery - Business continuity is key for any organisations. With a growing reliance on telecommunications, satellite broadband provides the ideal Disaster Recovery solution for when traditional communication links are down. 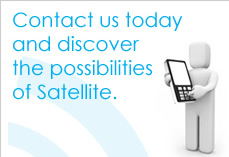 Satellite is less susceptible to many potenital weakness such as weather, cable breakages or switching failures. Telemetry - Often data needs to be transmitted from areas that have little or no existing connectivity. Rather than installing expense cabling or wireless connectivity a satellite connection provides an ideal short term connection and facilitates the collection of data from remote sites. Copyright 2012 - BayCity Communications Ltd.